Hearts are in advanced talks with former Scotland goalkeeper Matt Gilks as they close in on Neil Alexander’s replacement. Gilks is keen on becoming No.1 at Tynecastle and visited Riccarton last week. He is Hearts’ preferred choice to succeed Alexander and is available for free with his Burnley contract due to expire. Talks are also progressing with Faycal Rherras, the Belgian full-back who is leaving Sint-Truiden. 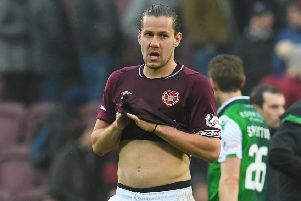 He is in negotiations with Tynecastle officials over a switch to Scotland and the Evening News has learned that discussions are moving forward. Gilks would be Hearts’ No.1 goalkeeper for next season as they embark upon a European campaign and aim to mount a challenge in the Ladbrokes Premiership. The Edinburgh club are also in the market for a back-up keeper after severing ties with Alexander on Tuesday night. He met head coach Robbie Neilson for definitive talks but did not want to sign a new contract as second-choice. Gilks, 33, has spent the last two seasons as Burnley’s reserve goalkeeper behind Tom Heaton. He has options to remain in England but would get the chance to play every week in Scotland’s top flight, which would be a major factor in his decision. He has three international caps and qualifies for Scotland through his Perth-born grandmother. He made his debut in dark blue under Craig Levein in August 2012 as Scotland beat Australia 3-1. Levein is now director of football at Hearts. Any transfer business at Tynecastle is unlikely to be announced before June 9 – the official opening of the summer transfer window. New arrivals will then be registered with the Scottish Football Association, and Gilks and Rherras could be the first two names unveiled.